More Than a Dress Panel Discussion: How Does the Dirndl Fit in Modern Austria? 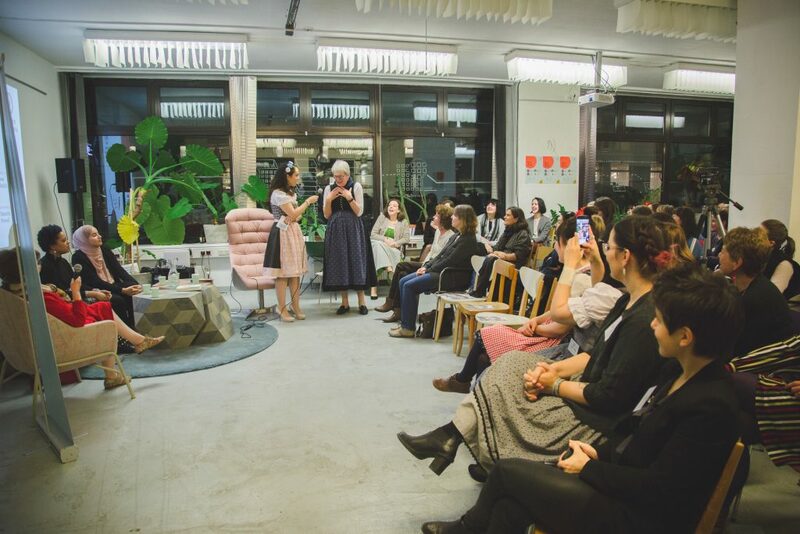 Friday, November 16, 2018-Vienna, Austria// A crowd of over 80 local and international women* came together last Friday evening to learn more about the traditional women’s dress, the dirndl, and how it fits into a modern, multicultural Austria. 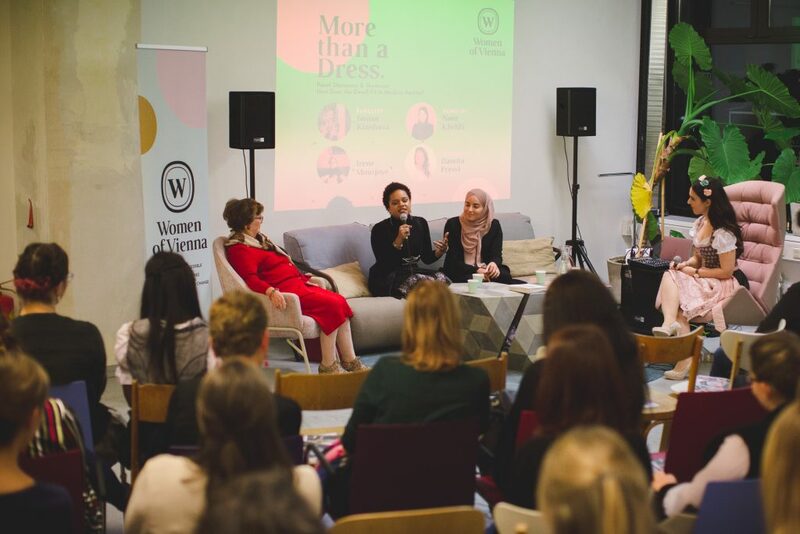 The “More Than a Dress” event was held at co-working space Das Packhaus and was hosted by Women of Vienna. 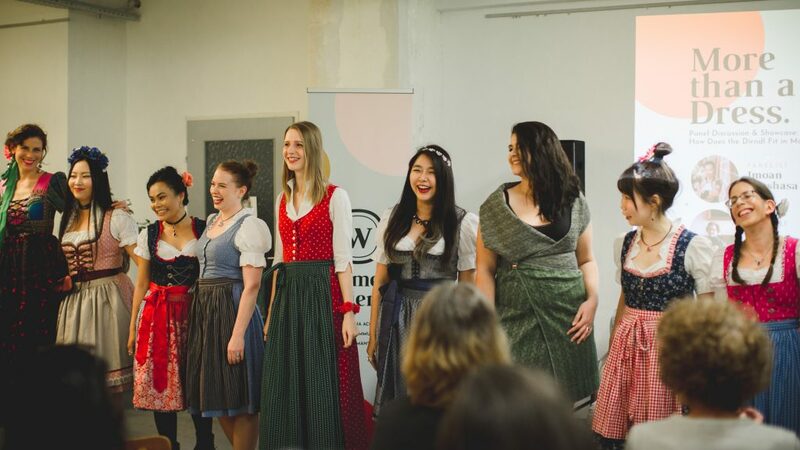 “We wanted to give the women of our community a glimpse into what a complicated symbol the dirndl is and what it means to different women,” explained Women of Vienna co-founder Molly Roza, who initiated and led the event. 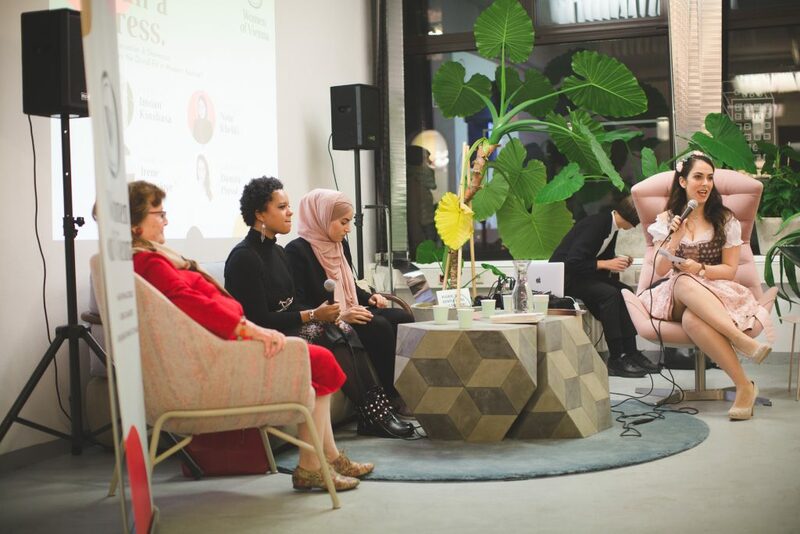 The event was moderated by journalist and presenter Damita Pressl and featured a diverse panel of 3 dirndl experts, each with her own unique dirndl story. VICE Magazine columnist Imoan Kinshasa described her experience with racism as a black Bavarian woman in Tracht at an Austrian wine festival, while Viennese journalist Nour Khelifi explored the multilayered identities and clothing choices of young Austrians from various backgrounds, and author and lecturer Dr. Irene Montjoye provided cultural and historical context about the development and popularization of the dirndl. Dr. Gexi Tostmann of Tostmann Trachten was also present and settled the oft debated “rule” of how to correctly tie a dirndl apron depending on your relationship status. According to Tostmann, the “rule” was made up by a journalist a few decades ago, simply looking to spice up a story. The current political context surrounding the dirndl and how to navigate the stereotypes often associated with wearers of Trachten, especially by people who may not seem “typically Austrian” externally, was discussed in depth. “We don’t look Austrian but we ARE Austrian,” said panelist Imoan Kinshasa. “The dirndl would not survive if we don’t come forward and bring it into the future, into now. There is no right or wrong (way to wear it) as long as I appreciate what I’m wearing and know where it’s coming from. I will not let them take it away from me,” said Kinshasa. The panel was preceded by an eclectic dirndl showcase featuring designs by Barbara Alli of Hand Made Story, KUKLA, and various reclaimed dirndls provided by We Love Dirndl. Designs by Tostmann Trachten were also on display. “Everybody should reclaim what they want to wear. Identity is a construct with a lot of different factors. 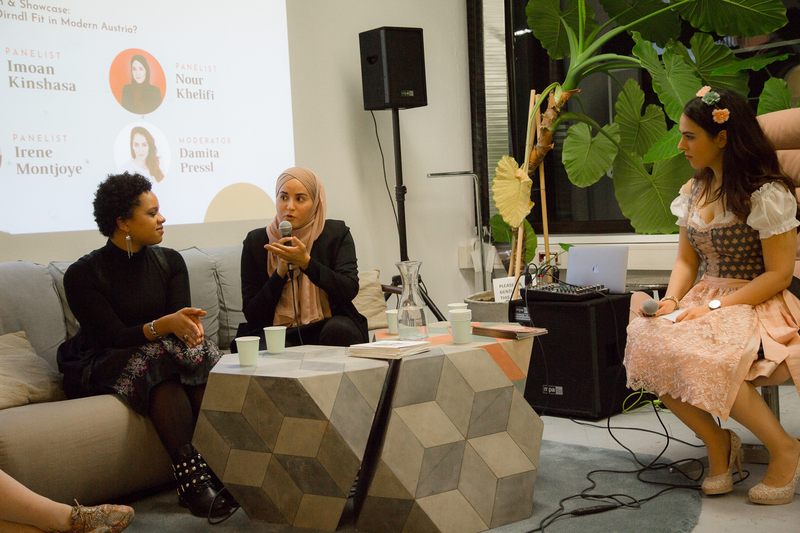 We just can’t define identity because of your ethnicity or religion anymore,” said Nour Khelifi, panelist. “Now it’s up to the Austrians to decide whether their definition of Austrian is broad enough to encompass the women on stage tonight.” – Molly Roza. Women of Vienna is a non-profit organization dedicated to providing resources and a powerful network for both international and Austrian women living in Vienna. Our mission is to make Vienna accessible, to bridge communities, and to encourage woman* led change. The group originally began as a Facebook group in 2015 and has quickly grown into a lively community with over 16,000 members from very diverse backgrounds. Women of Vienna hosts approximately 15 offline events per month and 4 signature events per year. For more photos of the event, visit our Facebook page here. https://www.womenofvienna.org/wp-content/uploads/2018/11/more-than-a-dress-28.jpg 1280 1920 Women of Vienna http://www.womenofvienna.org/wp-content/uploads/2018/03/Untitled-design-4-300x100.png Women of Vienna2018-11-28 21:55:562018-11-28 22:21:49More Than a Dress Panel Discussion: How Does the Dirndl Fit in Modern Austria?